Objective: Single incision laparoscopic surgery (SILS) is a new advance wherein laparoscopic surgery is carried out through a single small incision hidden in the umbilicus. The use of this technique has been described for many urological and GYN procedures. However, the use of this procedure in general surgery so far has been largely limited to cholecystectomy. Little has been published of its use in other general surgical procedures. The objective of this study is to describe the safety and feasibility of SILS appendectomy in a single community based institution. Methods: A retrospective review of a prospectively collected database was reviewed on all patients who underwent SILS appendectomy. Both single incision three-port technique as well as single incision dual-port technique with transabdominal suture retraction of the appendix was used. All patients were included including any conversions to traditional laparoscopic technique. Operative and perioperative outcomes were analyzed using standard statistical methods. Results: 8 SILS appys (6 three-port and 2 suture retraction) were performed from 7/30/08 – 10/1/08 (indications: 5 early, 2 suppurative, and 1 gangrenous). There were no conversions to traditional or open techniques. No perforations were identified. Mean BMI was 25.5 (rng: 22 – 30.5), mean OR time was 41 mins (rng: 30 – 55), mean EBL was 5 cc and mean skin incision length was 1.7 cm. Complications include one minor wound infection. Mean 10-point pain score prior to discharge was 2.6 (rng: 0 – 6). Number of days of post op oral narcotic use was described as minimal (1 day) in 5 pts (63%), moderate (1- 3 d) in 1 pts (13%), and heavy (> 4 d) in 2 pt (25%) with follow up accomplished in all 8 patients. 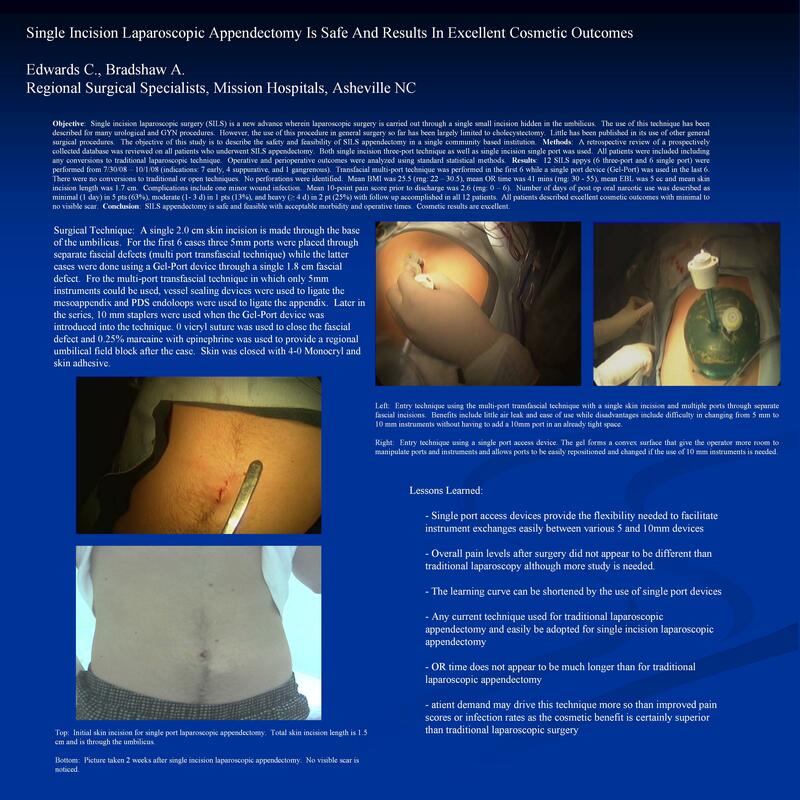 All patients described excellent cosmetic outcomes with minimal to no visible scar. Conclusion: SILS appendectomy is safe and feasible with acceptable morbidity and operative times. Cosmetic results are excellent.